The LRCEA organises a Specialist Show each year. The LRCEA organizes training for all dogs at all levels every week, year round. The Labrador Retriever Club of East Africa is a specialist club but also offers membership to anyone wanting to train any type of dog in obedience or the Gundog disciplines. Membership charges are, an initial fee of Ksh 3,000/- one time only, and an annual subscription fee of Ksh.2,000/-. Membership allows you to take part in Wednesday morning training (at 10, for an hour) at the Kennel Club Show grounds on Kibera Drive. Training covers general obedience and social skills for the dog, for free. 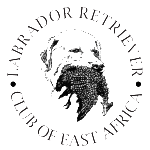 The Labrador Retriever Club also organizes Good Citizen Dog Training and exams. Being a member of the LRCEA also allows you to join in on “doggy weekends” away, which are a great chance to get out of Nairobi with the entire family. Please download or fill in our membership form online, then join us on Wednesday morning during training at the Kennel Club Show ground. Click the relevant button below to download the Membership form or fill it in online, then come and join us on a Wednesday morning (always bring your dog’s rabies certificate, and do not bring puppies before they have finished their first batch of vaccinations (especially Parvo).